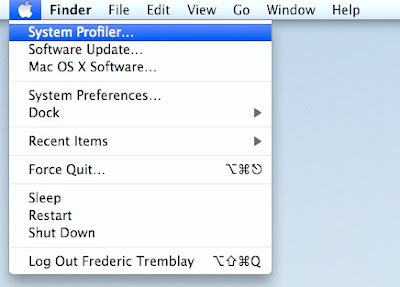 A New Mac Tip Every Day: Shortcut to System Profiler! My mac has been running a little slower than normal as of late and I was wondering if anyone with more knowledge about the computer had any suggestions for me. Oh great. Love your site but you need to hold down a key instead of pressing your mouse. Not much of a time saver. Wonder why Apple turns these things into Easter eggs instead of putting them right there in the drop-down list. I agree with your post however, seeing as how notebook users are generally deprived of a mouse, these tips are preferably better suited for MacBook (Pro) users. force quit (current program), presenting the same effect. my last macbook pro burnt to death recently. on her keyboard was an enter key next to the arrow keys. this was perfect for my little finger to use. i now have a brand new mbp without this enter key.... please, someone.. HOW CAN I GET IT BACK?!!! camden...replace the "option" key on the right side with an "enter" key. that should work! no but really...the new mbp keyboards are like that. if you want your old one back you have to replace the entire top panel, which includes your keyboard, speakers, and trackpad. i dont suggest it...just get used to it, and be happy that you have a brand new laptop. I've found I actually prefer this "option" key method. If you actually look through menus a bit there are several of these things that will change and show up - and ultimately they are things you so infrequently use anyway - why would you need them cluttering up your menu bars anyway? So I know they are there with the "option" press method - and that's good enough. If you go under the "Sharing" option in your System Preferences - select Remote Management - then select Options. If you click one of the check boxes while you hold down the Option key - it will select ALL of the boxes. Make sure you have enough RAM. Apple recently began shipping all but its most inexpensive computers with 2 GB of RAM. If you don't have at least that much, it is probably time to think about installing more RAM and you can install it yourself! There is also a free program called OnyX that is very good for maintaining your Mac. Go to Google and type in OnyX, it ill show you the link where you can download the program. Make sure you download the correct version for the type of Mac that you have and read the help section of the program before running it so you have an idea of what each part of the program does.